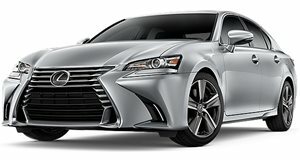 Some leaked photos of the upcoming 2012 Lexus GS have found their way online just ahead of the sedan's debut at Pebble Beach. The 2012 Lexus GS appears ready for Pebble Beach with some unwrapped prototype photos already being leaked on the web. Seen in the leaked spy photos is an all-wheel-drive GS 350 prototype that looks a lot more complete than the Lexus teaser image shown not too long ago. The GS mimics the attractive and well-received LF-Gh concept from the 2011 New York Auto Show. Almost all cars lose a bit of finesse in the transformation from concept to production. Sadly, it appears as if the GS seems to have lost a little more than we expected, specifically in the rear taillight design. The picture shown here appears to be the low-end of the model range, so it&apos;s not the the F Sport or V8 model. We&apos;re just a few days away from Pebble Beach, so we should have official photos very soon.